New Day heads to the ring. Xavier Woods and Big E talk about the incredible journey of New Day over the past few years. They thanks the fans for being with them along the way. Big E also says that New Day has discussed walking away from WWE in light of all of the unfair obstacles being thrown at Kofi. Woods says the toughest thing for him has been the poor treatment Kofi has received lately and over his WWE career. However, New Day can’t make the decision to leave until they get some answers, and Vince McMahon is the only person who has the answers they need. Therefore, Woods calls out Vince. Vince McMahon heads to the ring. As Vince begins to speak, Daniel Bryan interrupts as he and Rowan come out to the stage. Bryan doesn’t want Vince to placate New Day’s “fragile” egos. Bryan calls New Day a stale novelty act and says that if they want to leave, let them. New Day can be replaced by any three random people and be even more successful. Kofi lost at Fastlane and Elimination Chamber. Bryan says Vince has been right about Kofi every step of the way. The fans are wrong. Woods says Bryan is scared to face Kofi one on one. He says Bryan has turned into everything Bryan used to fight against. Bryan is a hypocrite. Bryan begins to respond, but Vince tells everyone to shut up. Vince says that New Day isn’t going to quit. They’re not quitters, and they never seriously thought about it. Vince says Kofi is a B+ player, and he wonders if Woods and Big E are B+ players as well. He says that Kofi has run out of opportunities, but Woods and Big E will have a chance to put Kofi into Wrestlemania. If Woods and Big E can run a tag team gauntlet, then Kofi will get his Wrestlemania match. Sarah Schreiber welcomes Becky Lynch. Becky Lynch says she is bringing the people to the main event of Wrestlemania and that Ronda Rousey brings the title, but what does Charlotte bring to Wrestlemania? Charlotte’s music interrupts Lynch. Charlotte Flair heads to the ring. Becky says Charlotte is undeserving of her spot at Wrestlemania? Charlotte is about to show Becky how deserving she is. This was a very good match, but it should have happened at Wrestlemania. This match wasn’t a big, fun surprise, it was an obvious attempt to add unnecessary hype from Charlotte since she’s being overshadowed by both Becky Lynch and Ronda Rousey. I enjoyed the action I just saw, but I think the idea behind the match is garbage. Sarah Schreiber welcomes AJ Styles. Styles says he is honored to face Kurt Angle in his last match ever on SmackDown. Styles isn’t taking his match with Angle lightly though. Angle might have laid the foundation for SmackDown, but this is the house that AJ Styles built. Unfortunately, this match was cut very, very short by an attack from Randy Orton. It makes sense heading into Wrestelmania, and it makes Orton look like a huge jerk. So it worked for what it was meant to do. Unfortunately, we didn’t really get to see Styles versus Angle one last time. Earlier today, Rey Mysterio and Dominic talk about Rey beating the big bully Samoa Joe. The Miz heads to the ring. Miz is still quite upset about Shane McMahon putting his hands on The Miz’s father. Since Shane did that, Miz wants to make their match at Wrestlemania Falls Count Anywhere. Shane McMahon comes out to the stage, and he is preceded by security guards, SAnitY, Primo, and Shelton Benjamin. Shane says Miz is as dumb as his father looks. Shane feels great every time he thinks about and rewatches his attack on Miz and his dad at Fastlane. He wants to embarrass Miz even more, so he accepts Miz’s falls count anywhere stipulation. He finishes by saying that Miz’s dad’s greatest MIZtake was when he impregnated Miz’s mother. Miz runs out of the ring and fights his way through Shane’s security guards. Miz then takes down Primo and Shelton Benjamin, but SAnitY swarms and stops Miz. Miz manages to recover and fight SAnitY out through the crowd. The IIconics are very excited that they will be making Wrestlemania iconic by competing for the Women’s Tag Titles. Very good match. This was maybe one of the more interesting gauntlet matches in how each fall felt very different. There was a story within the match itself, and that was fun to watch. It was also quite satisfying as a whole while a lot of other gauntlet matches ultimately end up being frustrating. All the superstars watching the match in the back head down to ringside and applaud New Day. The show was entertaining. Most of the show was taken up by New Day again, and that was perfectly fine with me. 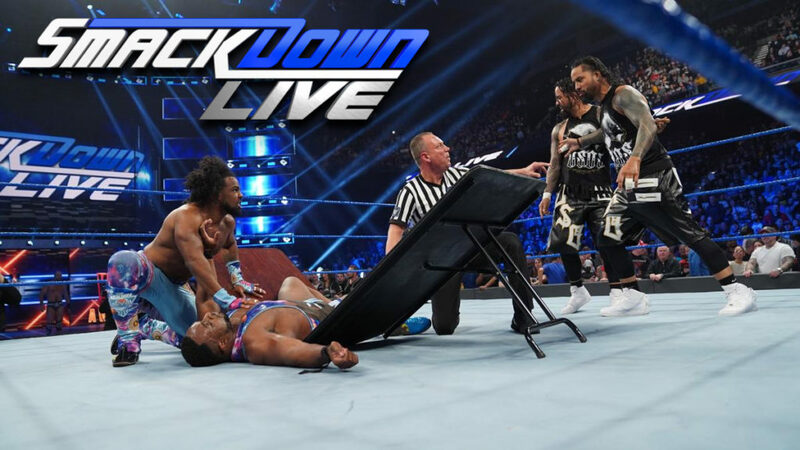 We finally had a night where the New Day stuff didn’t end up frustrating. The frustrating part of tonight was the women’s title situation. The match was good, but it was pointless to have the match tonight. It was a wasted opportunity, and it’s further proof that the main roster either has no faith in Asuka or just has no idea what to do with her. Either way, they’re being dumb. It was fun, though WWE has conditioned me to not believe anything that comes out of this match until Wrestlemania actually happens.